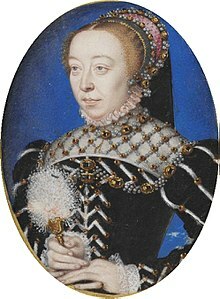 Catherine de' Medici (Italian: Caterina de Medici, pronounced [kateˈriːna de ˈmɛːditʃi]; French: Catherine de Médicis, pronounced [katʁin də medisis]; 13 April 1519 – 5 January 1589), was the wife of Henry II of France. Catherine was the daughter of Lorenzo II de' Medici. She was born in Florence, Italy. She was born Caterina Maria Romula di Lorenzo de' Medici. Catherine is buried in the Saint Denis Basilica. This page was last changed on 22 April 2019, at 12:13.